Vitruvius was a prominent and widely celebrated Roman architect, author and engineer, whose work has continued to inspire the world even centuries after his death. He is best known for his influential treatise, titled “De Architectura” (On Architecture) that is considered a handbook for architects. Historians have been unable to gather much information about the early life of Marcus Vitruvius Pollio, little that is known about his life, is through the works of Pliny the Elder and Frontinus. Vitruvius’ birthplace is either said to be Fundi, a city located between Rome and Naples, or Verona, located in Northern Italy. 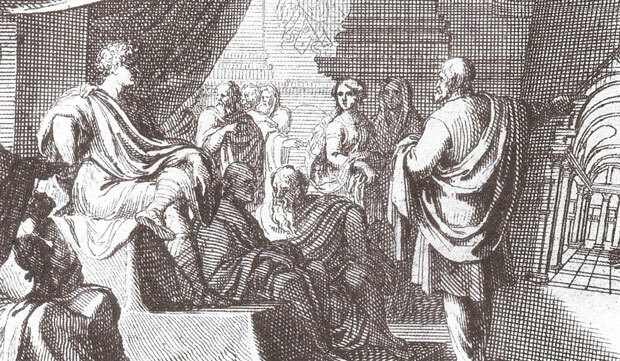 Historians suggest that Vitruvius hailed from an influential and affluent Roman family, and was educated in architecture, in addition to serving Caesar’s army with the engineering corps. Vitruvius conducted extensive travels with the army and is said to have served in Gaul, the fortress of Larignum and Marseilles. In 46 BC, he served the army at the Battle of Zan, and the Second Punic War in Zama, Northern Africa. Following Caesar’s death, in 33 BC, Vitruvius joined the army of Octavian as a military engineer and became involved in the development of aqueducts. Vitruvius’ magnum opus, and only known work is the ten volumes of “De Architectura” (On Architecture), which he compiled during the last days of his life. This treatise is credited for Vitruvius’ rise to fame, and deals with his own experiences as an architect, as well as, an analysis of the works of other notable Greek architects including Hermogenes. It covers all aspects of architecture, however, its only limitation is the fact that all Vitruvius’ theories are primarily based on Greek models, and the world has departed from these ancient models through technological evolution. The ten books of De Architectura discuss city planning and designing, building materials; temple construction and the use of the Greek orders; public buildings (theatres, baths); private buildings; floors and stucco decoration; hydraulics; clocks, mensuration, and astronomy; and civil and military engines. The first book deals with the motivation and learning of an architect, and Vitruvius goes on to discuss the basic elements of architecture while designing and planning a city, such as observing the direction of the wind while planning the direction of the streets. The second books deals with the origins of architecture, and discusses a variety of building materials including, bricks, sand, lime, pozzolan, stone and timber. The third book discusses the symmetry of the human body and temples, along with a set of guidelines instructing on the proportion of columns and the rules for constructing Ionic temples. The book VI discusses temples in great details, it provides guidelines about temples doors and altars, and cites the examples of Doric and Tuscan temples. The book V deals with the construction of public buildings, including the forum, the basilica, the theatre, the palaestra, the baths and harbours. The sixth book is about private houses of Roman and Greek style, and focus on symmetry, proportions and climate. The seventh book contains instructions on various types of interior decorations including, stucco work, fresco painting, and also, it discusses the material required for producing artificial and natural colours. The eighth book deals with water, how to locate it, and the dynamics of rainwater, aqueducts, wells and cisterns. Book IX deals with astronomy, and the use of mathematical tools such as doubling a square, constructing a right-angled triangle, the principles of sundials and water-clocks among others. The last and final book discusses the use of machinery in engineering, both for construction and military purposes, Vitruvius lists down and explains the methods of using a pulley, water-screw, the pump of Ctesibius, the hydraulic organ, the hodometer, and other military machines such as scorpions, engines, tortoises etc.